For motorists and commercial drivers which political Party is best for your vote? The results are in. The staggering ignorance towards effective ways to lower emissions by the Government continues to perplex millions of diligent drivers. Their myopic and out of touch dogma that by simply taxing drivers more, will solve the issue is tantamount to pre-kindergarten levels of intellect and stinks of incompetence. With Supermarkets, at last, driving down pump prices due to Brent Oil falling by 9% in Sterling since the beginning of February, the Government continues to say that 37m drivers see pump fill up costs reflect oil price changes within 7 weeks. But this claim is in no way reflected in the wholesale and retail data collected in the last 12 months**. As oil rises & Sterling weakens Fuel Suppliers opportunistically fleece UK Drivers at the Pumps. The APPG* on Fair Fuel for UK Motorists and Hauliers calls for the introduction of a new independent watchdog to monitor fair pricing and transparency at the pumps. FairFuelUK supporters are incensed by the latest blatant rocket increases in petrol and diesel, that will impact on inflation and growth in the economy. Only 1 in 100 UK drivers believe that adding a pollution tax to diesel will improve the environment. With 4 out of 5 diesel drivers saying they have no choice but to drive the same mileage even with a speculative green tax added to their fuel bill. 98% of drivers believe such a tax hike would cost jobs, increase inflation and purely just raise extra cash for the Treasury. See full survey results below. CLICK HERE to convince your own MP to ask the Chancellor for a fairer tax deal for UK drivers. Do you remember before the EU Referendum, Goldman Sachs via the AA, both saying that pump prices would rocket by 18 pence per litre? A plethora of highly paid PR Execs in motoring organisations jumped on project fear’s doom wagon to say the same. See the published article here. We at FairFuelUK (that’s Quentin Willson and myself) said then, and have been proven right that this would never happen. Supermarkets will at last cut pump prices by 2p per litre. Asda’s new national price cap will bring diesel down to 106.7ppl and unleaded down to 105.7ppl at all its 272 petrol stations. FairFuelUK and MPs accuse fuel supply chain of using Brexit to over inflate prices at the pumps. 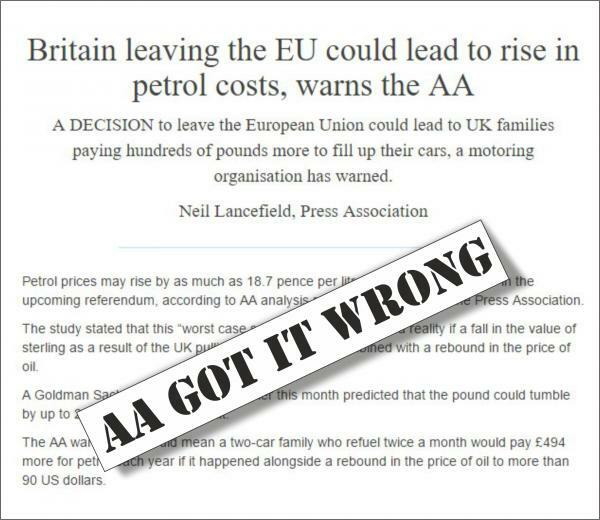 We were told that petrol prices would soar if the UK voted to leave the EU. Concerned 'experts' cited the combined threats of currency shifts, rises in the price of oil and a general economic Armageddon. But oil and fuel wholesale costs have actually fallen since the 23rd of June by 3 to 4 ppl. Prices at the pump should therefore be lower by 3p but they're not - and the only reason we at FairFuelUK can find to justify this is speculation driven by a cloak of supposed market uncertainty. Supply Chain Businesses are Knowingly Profiteering from Falling Oil Prices. If UK falls back into recession the last thing we need are higher transport costs. Autumn Statement could turn out to be one of the defining moments in this Government’s fiscal history. Quentin Willson says: We can’t blame drivers for going for the cheapest running costs. Government policy forced us to buy diesel cars. Fair Pricing - When Will it Come? Leading economist sees lower oil prices good for UK economy. Why are 32m UK Motorists, Commercial Drivers and the Vital Haulage Industry being ignored by all Political Parties in the Lead up to the General Election? 5p Fuel Duty Cut for just 125,000 Motorists. Can that be fair? The Labour Party do not seem to care about 32 Million UK Road Users? Labour think-tank close to the 2 Eds wants to see fuel duty doubled. When will they learn? FairFuelUK Challenges MEPs on unfair fuel prices in the UK compared to the EU. Oil Speculation increases oil price. Why. Ukraine issue used as excuse. Commercial Motor asks is Road Charging an Alternative? What do you think? Another victory for FairFuelUK Supporters. FairFuelUK Summer Poll. We need your help! Quentin Willson correspondence with the FSA about alleged "Oil Price Fixing"
Are Diesel and Petrol Prices being rigged? 14p per litre Fuel Duty cut or the re-introduction of the 10p Income Tax Rate? Why a $11 hike when oil inventories are plentiful and demand low? This is a $20 trillion casino with thousands of players betting on rising numbers. Foolhardy? No, idealistic in our aim for fair fuel pricing for all. Clearly the oil market is manipulated. It is well past time some began the Herculean task of taking on the oil gang and all their vested hangers-on. Oil Speculators. I told you they have been fiddling prices! FairFuelUk says - Name, Shame and Prosecute Oil Price Exploiters - NOW! You’ve seen what we can achieve with 300,000 supporters. Think what we could achieve with a Million! RHA welcomes Chancellor’s pain relief measure. China slashes fuel prices to boost demand. Why can&#039;t the UK do the same? Nadine Dorries MP: "The Chancellor must cancel Augusts 3p increase in fuel duty"
Fuel Duty Hike - Where does your MP stand? Fuel Prices Debate in Parliament:Chloe Smith Finance Minister, still misses the GROWTH point!!! Time to see where your MP stands on Fuel Duty. You can help to find out! Leadership, what leadership? You couldn&#039;t make it up. Budget Day Should be "Cut Fuel Duty Day"
Have you worked out what the government actually collects when you fill your tank? 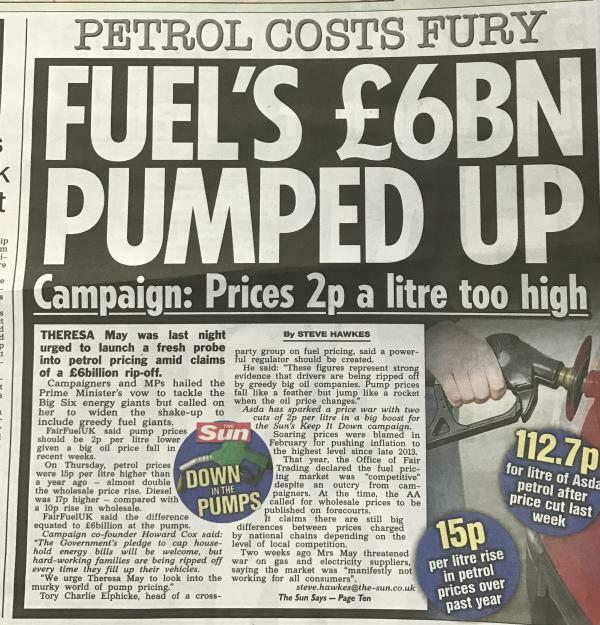 Sun Poll: Brits plead: Help on fuel now will get massive snub! Another 3 Experiences of High Fuel Prices sent to FairFuelUK by supporters. Another Experience of High Fuel Prices sent to FairFuelUK. Osborne rules out Fuel Duty Cuts in BUDGET. We are demanding an urgent cut in fuel taxes. NOW! Robert Halfon MP explains "Why we should all support FairFuelUK"
Shenanigans in Iran mean that wholesale prices have increased by 4.5p a litre. The SUN questions Parliament "Why ignore 100,000 ePetition for FairFuelUK debate?" "Don&#039;t blame high fuel costs on the oil companies. What about the speculators??" Fuel prices are bankrupting businesses. PROOF! PROOF! PROOF! FairFuelUK on BBC Radio 4 "You and Yours"
£637.8million hit to the treasury in lost taxes.